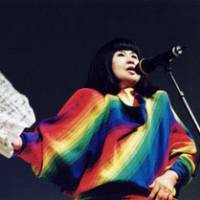 For the past half-century Kazuko Shiraishi has represented Japan in a number of international poetry festivals and conferences — in at least 28 countries, she tells me in a recent interview. 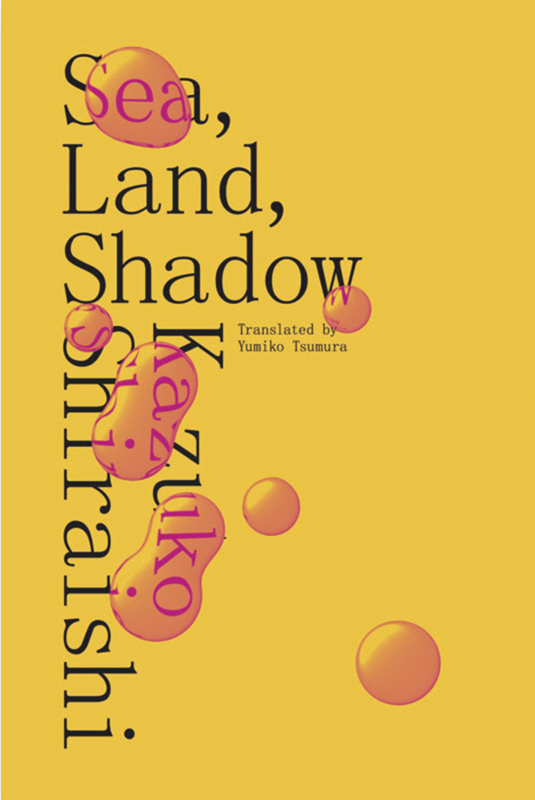 Sea, Land, Shadow, by Kasuko Shiraishi, Translated by Yumiko Tsumura. She says that among the non-Japanese poets she closely associated with over the years are Mazisi Kunene (South Africa), Yehuda Amichai (Israel), Jayanta Mahapatra (India), Willibrordus S. Rendra (Indonesia), Virginia R. Moreno (Philippines), Kim Kwang-lim (Korea), Gunter Kunert (Germany), Allen Ginsberg and Kenneth Rexroth (U.S.). 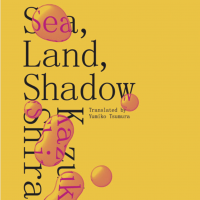 “Sea, Land, Shadow,” a selection of poems by Shirashi, has just been published by New Directions in English translation by Yumiko Tsumura. Though small, it covers work from all of her books, beginning in 1951. Shiraishi was born in Canada in 1931 and grew up in Vancouver. A popular and pretty child, she was happy and content. But in 1938, her mother, also Japanese Canadian, took her to Japan. Her father, who was doing well exporting herring and salmon to Asia, had already returned to Japan a few years before the Shanghai Incident in 1937. He had sensed Canada would clamp down on Japanese residents’ economic activities. By the time the rest of the family joined him in Tokyo he had become a magazine editor. The move to Japan turned Shiraishi into a “black sheep,” she wrote in her 1996 autobiography. The new country brought on feelings of disillusionment. Militarism dominated; Canadian school textbooks had been colorful fairy tales, but those she now had were insipid. 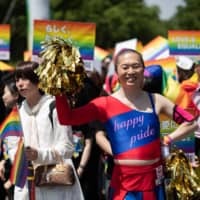 Surviving air raids first in Tokyo, then in Matsuyama in Ehime Prefecture, she went back to the capital once the war was over to attend high school. She soon found herself enmeshed in the postwar cultural upheavals. One day, she was struck by a line in a Ryuichi Tamura poem that she saw in the magazine Poetry and Poetics: “You, Earth is gritty!” It was vivid and precise. “I was excited, with a thump in my chest,” she wrote in her biography. Tamura was a member of the Waste Land group, which in 1939 had published a magazine titled after the T. S. Eliot poem. It was short-lived, but later revived in 1947. When Shiraishi attended a meeting of Poetry and Poetics with a romantic poem titled “Star,” she immediately attracted attention. She was 17, exotic, attractive, brash. One of the poets took her to the VOU Club — a space for “poets, artists, composers, architects and technologists,” as Katsue Kitazono, who had established it in 1935, once explained to Ezra Pound. It was Kitazono who one day said to Shiraishi, “Why don’t you publish a book of poems?” So she wrote several poems overnight, added them to her existing ones to make the book “Town Where Eggs Fall,” and had them published. She was 20. In those postwar days, poets and writers would engage in passionate debates, then repair to “kasutori alleys” in Shinjuku for cheap, strong drinks. 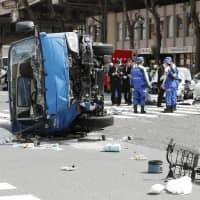 (“Kasutori” means “sake squeezed out of dregs.”) Shinjuku, where such pubs were concentrated, was like the Casbah in Julien Duvivier’s film “Pepe le Moko,” Shiraishi says. She hung out with a veritable Who’s Who of those who created the postwar literary and artistic milieu. Yukio Mishima, to whom she dedicated “A Vernal Planet” — the longest poem included in “Sea, Land, Shadow” — was among the luminaries, and she was close enough to the writer to receive a phone call from him just before his death. 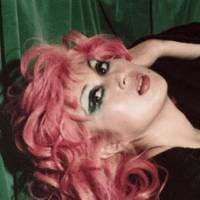 She also met Masahiro Shinoda, the future film director who would win fame for “Double Suicide.” She married him and had a daughter, but the two later divorced. 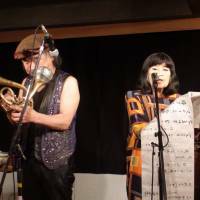 One thing that has marked Shiraishi as a poet has been “jazz poetry,” which all started when the poet Yu Suwa translated Allen Ginsberg’s “Howl” in 1960. 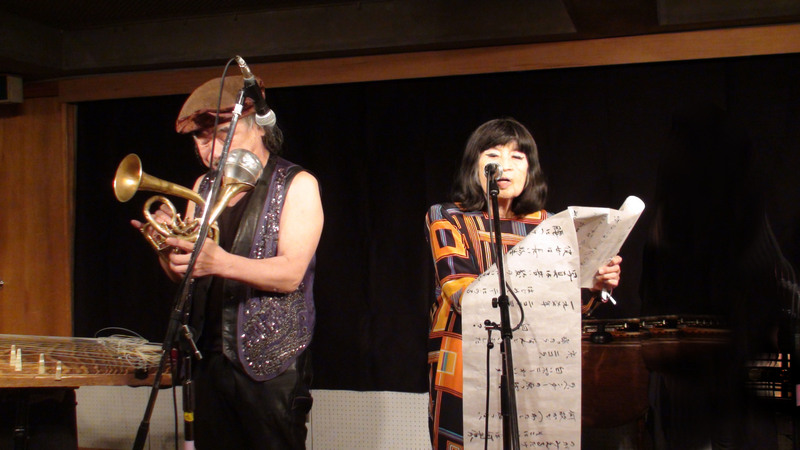 In the ensuing whirlwind of Beat poetry, Shiraishi started reading her poems to jazz accompaniment. The first one was “By the Hudson River,” which she did with her brother who had a jazz band. 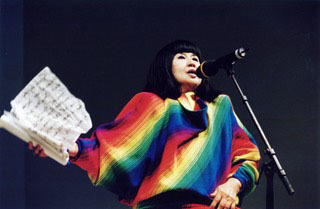 Many of her poems directly refer to jazz, such as “The Several Cats in Me in Love with Ornette Coleman’s ‘Lonely Woman,'” “Dedicated to the Dead John Coltrane,” “Now’s the Time” and “I Can’t Stand Myself (When You Touch Me).” By writing her poetry and reading it with a jazz band, “the rhythms, the hidden meanings and images” of the poems “are brilliantly drawn out,” even as “improvisation give them physical stimulation,” she says. In some ways, she may be comparable to the activist poet Jayne Cortez, though perhaps not as overtly political. The title poem of this new publication “Sea, Land, Shadow” was written in 2011, in reaction to the Great East Japan Earthquake that struck in March that year.